"Your own bit of paradise down on Cape Cod"
Breaking News: Please check http://www.saveblueberrypond.org/ for news of a major environmental threat to this beautiful pond. 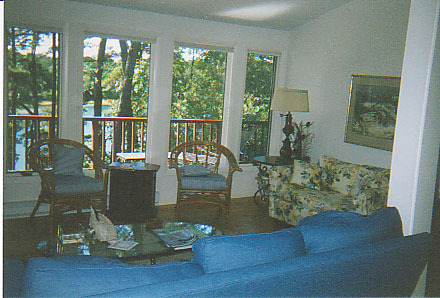 Our 4 bedroom house is on a charming pond in a wooded area in Brewster, MA. But you might decide to stay put and relax, looking at (or cooling off in) the pond. If you want to cook, there's a modern kitchen and a grill. And there's a foosball table and, of course, a TV, DVD, and VCR.